Enter your location to find a dui attorney close to you. See local dui attorneys in your area. Different rules apply to an under 21 driver charged with DUI. Watch this video to find out more. Are you from out of state but charged with DUI in California? We can help. Politics is a large part of defending against DUI cases. Learn how to fight your DUI charge with help from a DUI attorney. Other factors may affect how you perform on a field sobriety test. Is this your first DUI charge? Don’t go to court without an Orange County DUI attorney. Are you looking for a DUI attorney in your area? Driving under the influence (DUI) is a serious criminal charge that may land you in jail and may result in heavy fines, driver's license suspension or revocation and even increased auto insurance costs. Finding the right lawyer can make all the difference in your ability to effectively challenge your charges and avoid a conviction. This directory includes DUI defense law firms throughout the United States that handle a broad range of criminal matters related to drunk driving and driving under the influence of drugs, as well as similar offenses such as vehicular homicide and boating under the influence. Take this opportunity to review and compare the services and qualifications of local attorneys in order to find the one that is best suited to handle your case. Click here to find a DUI lawyer near you. Were you accused of drunk driving? 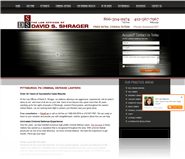 Your first step should be to contact the Law Offices of David S. Shrager for aggressive defense. What makes their team of professionals unique is the fact that each attorney has at least 30 years of experience in criminal law. Their main priority is to protect their clients' rights and fight to secure their freedom. With their impressive record of successful cases, you could have peace of mind should you choose to work with their team. They understand that being accused of a crime is one of the most frightening and difficult situations to be facing and so could be there to walk with you every step of the way. They are not only able to help clients in Beaver County, but throughout the entire Eastern United States as well. By simply glancing through their impressive record of successes in court, you will learn how they earned their reputation within the community. Their commitment to excellence in all they do has earned the respect and trust of the legal community as well as the families they represent. Each member of their team does not treat their clients as cases, but as individuals. Should you choose to work with them regarding your DUI case, you will be treated with personal attention and care. For a free initial consultation, please do not hesitate to contact their team. They are available 24 hours a day, 7 days a week because they know that you may need help at any time. Whatever questions or concerns you may have, you should not hesitate to get in touch with the Law Offices of David S. Shrager. Click here to visit their website and learn how they could fight for you and get your charges dropped. I have been arrested for a DUI for the 3rd time now, what penalties am I facing? How can I get to work if my license is suspended? I am in the military and have been arrested for a DUI, should I hire an attorney? The Verdict Is In on Marijuana DUI-Or Is It? How Long Can the Police Stop Me For? What Is Probable Cause for DUI Stops? Arrested for Domestic Violence? Too Much to Lose? How Much Should a California DUI Lawyer Cost?